Question: We live in an older home with almost no space in our bathroom for privacy. When my husband is in the shower the curtain keeps "floating" over to the vanity area making it hard to get ready for work in the morning. Any suggestions? Answer: Absolutely. We understand that shower curtains move around sometimes from the force of the spray. We recommend you get rid of that pesky curtain! 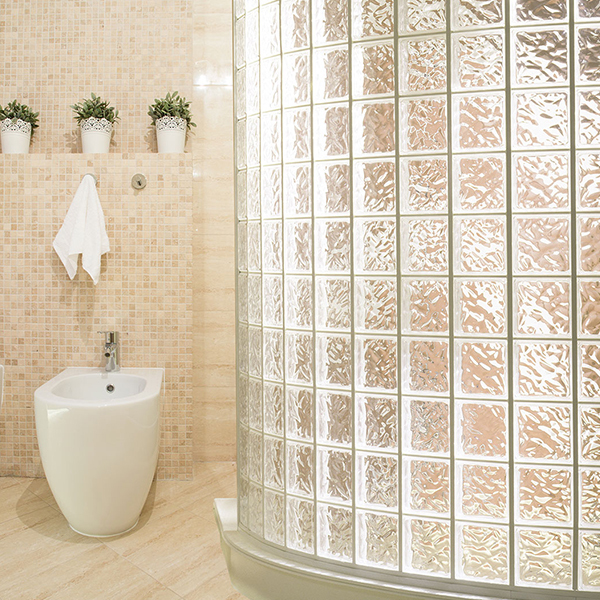 At Hy-Lite we manufacture custom acrylic block walls that are often used to create shower enclosures. There's no need for a curtain at all since these blocks are obscure and protect the privacy of the person in the shower. Lightweight and completely prefabricated, our interior block walls don't need any structural reinforcements. As a bonus you can select from flat or radius wall styles ... plus, we offer wave, glacier and cross rib block options so you can select the design that best complements your bathroom!